La Croix is owned by Peter, Louise and of course our two children Ellen and Matthew. We had been talking about buying a holiday home for many years before finally taking the plunge and buying La Croix. Our plans, though, never included buying a falling down shack in the middle of rural France, with limited knowledge of the language! This is however, what we did and with the help of friends, family and an excellent builder we have managed to restore La Croix and turn it into a fantastic holiday home which we love visiting! We had enjoyed many holidays in the Loire before buying La Croix and loved the peace and tranquility of the area. The area is full of great places to visit and there is nothing better than star gazing late into the night enjoying a glass or two of wine. La Croix has lots of character yet has all the modern facilities that you expect from a holiday gite. It is a perfect place to unwind and relax both in the Winter and Summer months - sat in front of the cosy log burner in Winter or sat on the patio looking over the wheat or sunflower fields in the summer! Perfect! Efficient electric heaters in all rooms and a log burner in the lounge. If you bring bicycles with you we will offer you the use of our garage in which you can securely store them. The garage isn't available for use generally but only where specifically requested. The spacious lounge/dining room comfortably seats 6 people and is equipped with a TV which receives English TV via Sky, a DVD player Wii games console and stereo with iPod dock. There is a large wood burning stove which can be used in the cooler months. The kitchen is modern and fully equipped with dishwasher, oven/hob, fridge/freezer, washing machine, microwave and Tassimo coffee machine. Nearest golf course is a 20 minute drive away at Bauge. There are also courses in Saumur and Tours. Whilst not specifically designed for disabled access the ground floor provides level and easy access between rooms with sufficient space in all the ground floor rooms to easily manoeuvre a wheelchair. All ground floor doors have a minimum clear opening of 780mm, however no specific handrails or grab rails are provided within the property. The ground floor consists of a lounge/dining room, kitchen, walk in shower room and large master bedroom and has level access to the front of the property. Outside: La Croix has a private and fully enclosed garden. We have provided garden furniture for 6 including an umbrella and 2 sun loungers for those hot days! The outside area is part grass part patio. The patio area is great to sit and watch the sunset over the fields as well as night time star gazing! Cleaning / Towels / Linen / Maid service: Prices for 7 nights or more include all bed linen, towels and an end of stay clean. For short breaks of less than 7 days a cleaning charge will be payable with the balance. Other: The layout of the ground floor accommodation is all on one level which makes it accessible for all ages and the less mobile. Lovely house in a beautiful, peaceful location Very well equipped everywhere apart from the garden chairs which were broken so not enough for all 6 of us to sit and eat outside. A brilliant location for visiting chateaux, swimming lakes and wine-tasting at the caves in Saumur. Darren gave really useful information and recommendations for visits in the local area. Thanks for your review, we are glad you enjoyed your stay at La Croix and the peace and quiet it offers. We are sorry some of the garden chairs were broken, we are replacing these for next Summer season. We did purchase 4 new lounger chairs this year but appreciate these may not have been suitable for sitting at the garden table. It is also great to hear that you enjoyed the local lakes, chateaux and wine. Thank you for booking with us and if you want a return trip, please get in touch. Had an excellent few days in La Croix, a fantastic base for exploring the surrounding area. Really peaceful location with fantastic accommodation - definitely worth a return. Great communication from the owners. Thank you for choosIng La Croix for your holiday and for your lovely review. It is always great to hear that guests enjoy La Croix as much as we do! We would love to welcome you back for a return visit, so please get in touch! Lovely relaxing break in the Loire countryside. La Croix is comfortable, spacious & well located. A fantastic renovation keeping the old character yet providing modern amenities. As soon as we arrived we felt at home and relaxed. A great place to get away from it all!! The lazy days sat on the patio looking out over wheat and sunflower fields were perfect. Lovely visits to Saumur, Bourgueil and Plan d’eau de Hommes made for a great holiday. Thank you - we will return! Thanks, we are glad you had a lovely holiday. We look forward to welcoming you back soon. Really nice property, very well finished and furnished. Excellent location for exploring the area. The house is warm and welcoming, great shower and very comfortable beds. We loved our stay here, peaceful and homely. Great communication from the owners too. Thanks Graham, we are glad you enjoyed your stay at La Croix. We would love to welcome you back sometime in the future. Just spent several days here. Can’t praise it enough. Perfect for families and / or those couples wanting to escape. 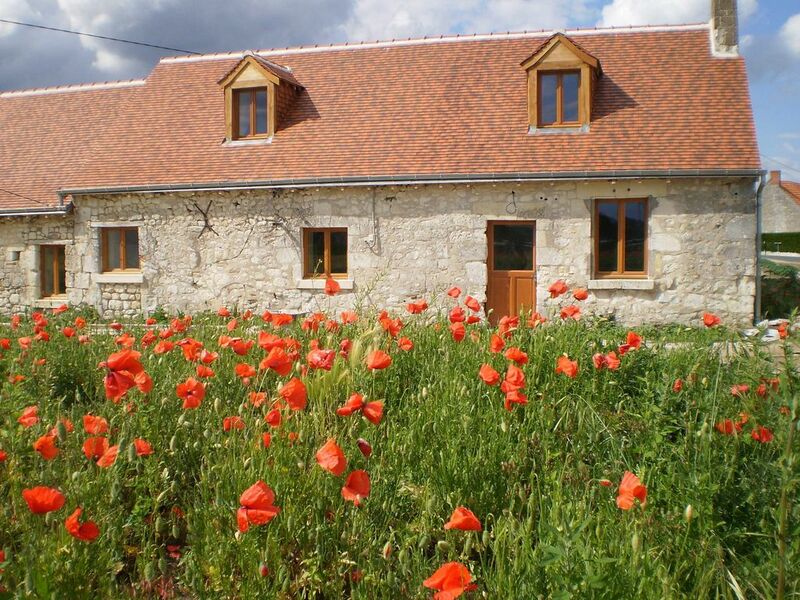 Set in the Loire there is plenty to see and do close by while the cottage is set in tranquil and beautiful countryside. The interior is clean, modern and lacks for nothing without losing that ‘French countryside cottage feel’. Speak to the owners! - this place is worth a stay. Recommended 100%. I’ll definately be going again (...and again). Thanks for this fab review! We agree! It is perfect to explore the Loire Valley and also equally great to unwind and relax. We look forward to welcoming you again! Although not close to the coast there are plenty of choices for swimming too - the many natural lakes in the area have beaches and safe swimming areas which have lifeguards in the peak summer months. Canoe hire and organised trips are available throughout the region and the Loire-a Velo cycle path criss crosses the area offering many safe and scenic cycle routes. Caen - 21/2 to 3 hour drive; Dieppe - 4 hour drive; Calais - 5 hour drive. Brittany Ferries, LD Lines and P&O ferries operate these routes as well as Eurotunnel to Calais. Nearest airport is at Tours, a 50 minute drive with Poitiers (90 min drive) and Nantes (2 hour drive. TGV rail routes from Paris to Tours is also a good route. A car is essential and car hire is available at the main airports and railway stations. The area surrounding La Croix has lots to offer. It is great for cyclists with empty roads and endless forest trails, canoes can be hired at various points on the Loire, there are lots of local walking trails, fishing on the local lakes, horse riding, as well as opportunities for swimming at many of the natural lakes. In addition, La Croix is perfectly situated for visiting the many Loire Valley chateaux as well as family orientated theme parks and zoos. The local villages of Parcay les Pins, Gizeux and Vernoil have a range of amenities including boulangeries, bars and an excellent supermarket. The Musee Jules Desbois in Parcay les Pins is dedicated to the famous sculptor who was born in the village. The bar next door which takes his name is a typical French bar but serves good value food at lunch and dinner. The local villages of Gizeux and Breil boast impressive chateaux with extensive gardens. The nearest supermarket, petrol station and cash point are located in the village of Vernoil, a 10 minute drive away. The Loire Valley is a region famous for its many chateaux, vineyards, rolling landscape and historic towns. La Croix is located in the heart of this popular region. It is a UNESCO World Heritage area of outstanding beauty and it is situated on the edge of the Loire-Anjou-Touraine National Park. The picturesque and historic town of Saumur with its Chateaux and large selection of shops and excellent restaurants is a short drive away. La Croix is also perfectly positioned to visit the historic cities of Angers, Tours and La Mans all of which are within an easy drive. Booking Notes: Operated on a Saturday changeover basis during peak weeks, however we can be more flexible at other times of the year so please contact us. Outside of high season short breaks can be arranged, minimum stay is 4 nights and cleaning is charged as a compulsory extra (€70), linen and towels can be provided for an additional cost of €10 per person. We ask guests to leave the cleaning and linen fee in the property on departure. Prices for stays of 7 nights or more include all bed linen, towels and an end of stay clean. A 25% deposit will be required to confirm your booking with the balance being payable 60 days before your holiday date. Changeover Day: Saturday changeover is preferred in peak weeks during July & August but we can be flexible, please call us to discuss your requirements. Notes on prices: Nightly rate £75 (off peak), minimum 4 nights. For short breaks of less than 7 days a €70 cleaning charge will be payable, and bed linen and towels can be supplied at an additional cost (€10 per person), this should be left in cash the property on departure. Holidays from October to April inclusive will incur an additional heating supplement which is included in our Winter rates.